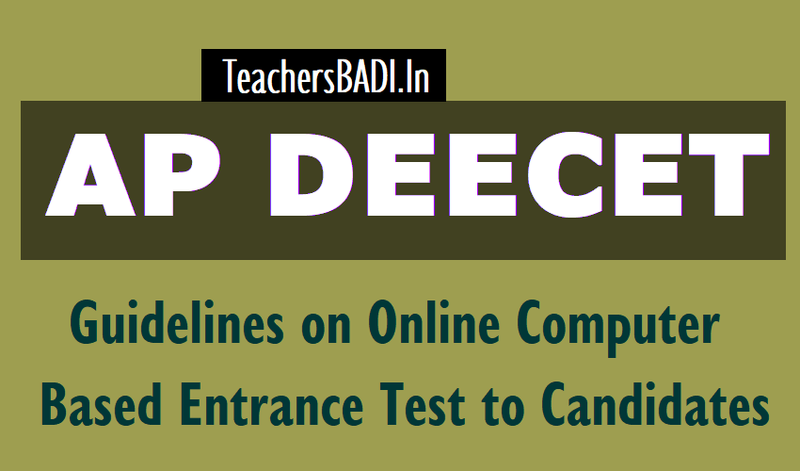 AP DEECET 2019 Guidelines/Instructions on Online Computer Based Entrance Test to candidates/DEECET Examination guidelines to candidates: AP School Education Department is going to conduct the AP DEECET through Computer Based Test(CBT) and DSE AP has given instructions on Computer Based Test to deecet applied candidates. So, candidates should follow the instructions before going to the online Deecet exam. PM for afternoon session and will not be allowed after designated time mentioned above. 3. Profile Information - Check the details & click on “I Confirm” or “I Deny”. 4. Detailed exam instructions - Please read through and understand thoroughly. 6. Please click on the “I am ready to Begin” button, after reading the instructions. 8. On the online exam question paper screen, balance time left for exam will be displayed on the top right hand corner of the screen. 9. If extra time is allotted to Physically Challenged Candidates , it will be displayed separately. 1. Red (Inverted Pentagon) - For unanswered questions. 2. White (Square) - For un-attempted questions. 3. Green (Pentagon) - For attempted questions. 4. Violet (Circle) - Marked by candidate for review. 5. Violet (Circle) with a Green tick – Answered but marked by candidate for review..
11. After answering a question, click the SAVE & NEXT button to save your response and move onto the next question. Please ensure that you click the SAVE & Next button before you move to the next question. 12. To correct/change any answer chosen for a particular question, please click on the CLEAR RESPONSE button. 13. At any point of time during exam, a ready reference of the questions answered, not answered, marked for review is displayed on the right side of the screen. 14. Questions that are answered and “Marked for Review” will be considered as ANSWERED. 16. You may view INSTRUCTIONS at any point of time during exam, by clicking on the INSTRUCTIONS button on your screen if necessary/required. 17. The SUBMIT button will be activated at the end of exam. Please keep checking the timer on your screen. Please ensure that you click the SUBMIT button before completing the test. 18. In case of automatic or manual log out, all your attempted responses will be saved. Also, the exam will start from the time where it had stopped. 19. Please inform the invigilator in case of any technical issues. 1. Do not touch the key board, as your exam ID will get locked. If your ID gets locked, please inform a nearby invigilator who will help in unlocking your ID and then you can continue with the exam. 3. Do not indulge in malpractices of any kind in the exam room. 4. Do not talk to or disturb other candidates. 5.You cannot leave exam room before 150 min. Please inform the invigilator if you want to use the rest room.